After having failed to sail from England on three earlier occasions and leaving behind her sister ship Speedwell, the Mayflower sailed from Plymouth for the New World on this day in 1620. Aboard were 101 passengers. Just ninety feet long and twenty-six feet wide, it hardly seemed the vessel to alter world history. The sailors cursed the pious passengers, whom they detested. Their food consisted of dried fish, cheese, and beer. The only sanitary accommodation was a single slop bucket. There was nowhere to bathe. 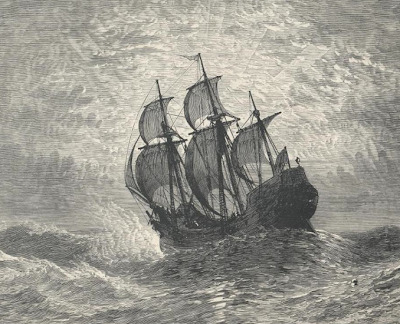 Seasickness was rampant during storms. With little air below decks, the conditions were nauseating at the best. Despite this, only one passenger died at sea. Two months and five days after sailing, the ship landed at Cape Cod. Before going ashore the passengers signed their famous Mayflower Compact. And thus began the saga of the Pilgrims in their new home: America.